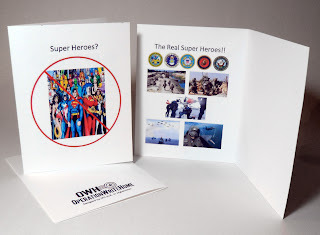 Memorial Day Bloghop: SuperAnyHero cards! ... AAFES [Army Air Force Exchange Services] has been using pogs – 1.5-inch polystyrene discs, for those who don't recall the 90's fad – as currency on military bases in Afghanistan and Iraq since 2001. Putting Marvel super heroes on the pogs in June 2008 simply made the program a little bit cooler. "We can't print money," said Dr. Jim Skibo, VP of Marketing and Advertising for the AAFES. "[And] we will not ship coinage into the warzone. It costs a small fortune to ship stuff like that, so we use [the pogs] as gift certificates." This hero was inspired to also make a 2nd card....awesome job! Would YOU like to use the first card as an AnyHero card? Click here to download it! It's two pages, and if you print the two pages two-sided, you'll get two cards out of one piece of cardstock. Happy letterwriting! Indeed, even here on the hero blog, we have candy to offer! There are three prizes sent in by Betty—thanks to her for giving us goodies to share! 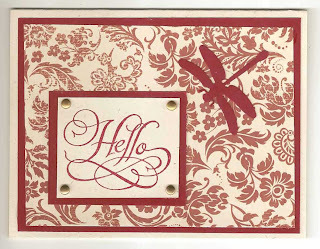 There are three stamp sets at left, each paired with two packs of paper with....wahoo! 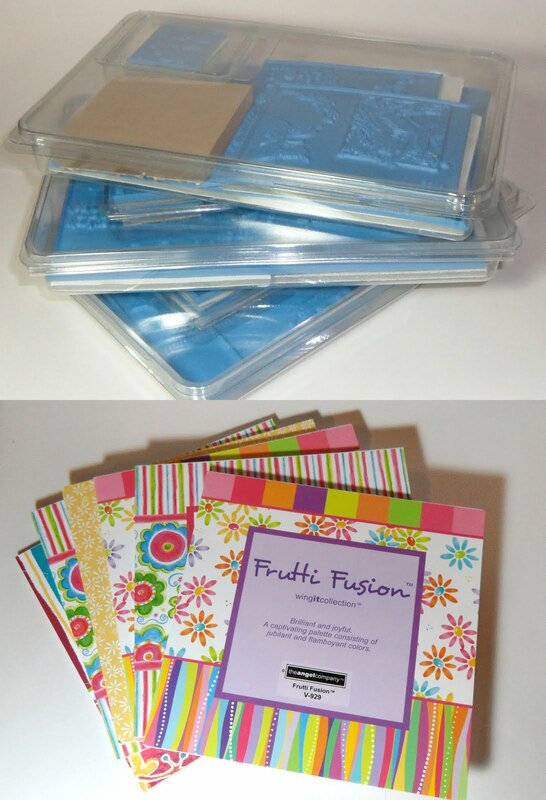 So many cards you can make with all these treats! To enter, leave a comment on this post for our hero who made this card...he'd love to hear your feedback on his creation! The next stop on the hop is Pieces of Fate - get ready for a FAB photo when you CLICK HERE! I am writing you today to thank you. I adore letters. To the point that my husband (now on his third deployment) and I have chosen them as our source of communication. We both love holding pieces of each other in our hands, and we have passed that love onto our kids. They choose not to Skype with him, would pass on a phone call at times, but his letters--oh how they squeal for them. My husband has lately been using cards from Operation Write Home. And he loves them; as do I. I can't thank you enough. 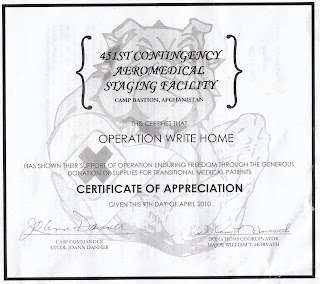 What a blessing you have been to sooo many Soldiers and civilians through "Operation Write Home." Thank you so very much for your hard work, diligence and huge heart. May the Lord bless you and the whole "Operation Write Home" team for being a blessing to so many! My son, Andrew, is 21 years old and doing his first tour in Afghanistan. His wife is here in the states by herself, dealing with a very difficult first pregnancy. He reports that he has been so thankful to be able to send her special cards throughout her numerous hospitalizations. 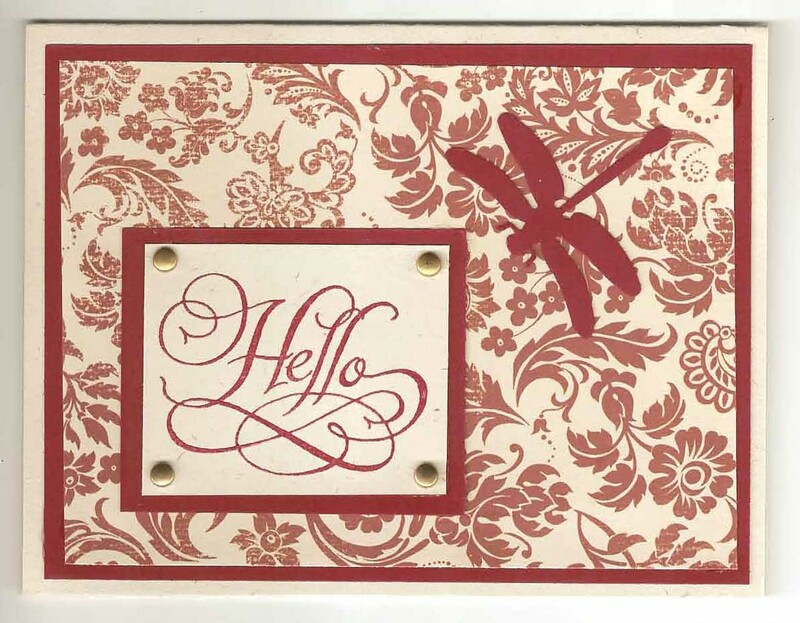 His still has no internet access, but when I spoke to him yesterday he asked that I once again thank OWH for the box of fabulous cards sent to him. The box is kept in the company office and he and his fellow soldiers have been so grateful to have homemade cards available to them. 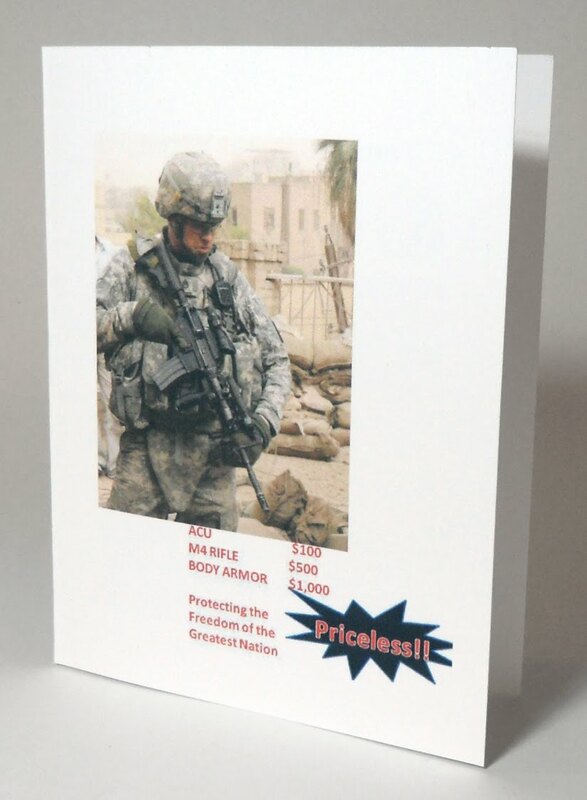 I, as a mom and recipient of one of those amazing cards for Mother's Day, also thank you from the bottom of my heart for what you are doing for the troops serving our country. It certainly makes for bright spots in what is alot of times dismal conditions for them. God bless you all! This is truly for everyone who makes cards and donates funds to OWH! Thanks for the card. Please send me more. How is the weather there? We received the 2 boxes and WOW! Thank you so much! What a fantastic selection, I know the troops will appreciate them, the extra cards we received earlier are nearly gone so yours arrived just in time. Thanks again Sandy for all your help ~ it is greatly appreciated! I am almost done with my deployment and will be heading over in just about 3 weeks . . . I received 2 boxes of cards from Operation Write Home to share with others here and it's a big hit. They are all so special and cute. 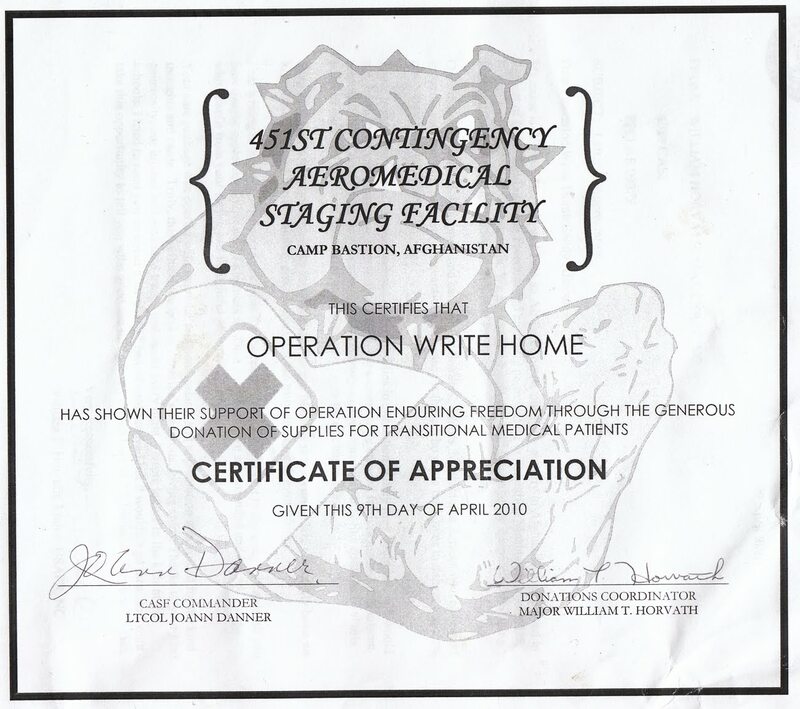 I am emailing to say thanks for the wonderful cards that you have provided for the men and women here at Kandahar Air Base. I was able to use your cards to send notes home to my husband and three kids letting them know that I miss and love them. The art work is second to none on the cards which allowed me to communicate to them in style. We are about to redeploy back to home station!! Hey Sandy thanks so much for all the cards you have sent. How are you?? I wanted to email you to Thank You for the extra box of cards and goods we received today, Mon 3 May. We will make sure they get to where they need to go.